How Is a Windshield Replaced? Do you need a new windshield? If you do, you probably have a couple of questions. The first concerns how much mobile windshield replacement costs in Georgia. The next may relate to how your auto glass is repaired. While the process seems pretty simple on the driver’s end, there’s actually some science that takes place on ours. Here is an overview from A-1 Glass Masters on how a windshield is replaced. We start by removing the plastic molding and old adhesive – First, auto glass technicians will remove all the plastic molding and old adhesive from the damaged windshield. These components are what hold your windshield tightly in place. They’ll be reapplied after your new auto glass is installed. Suction cups are used to lift the glass – Our techs will take two large suction cups and apply them to the surface of the damaged windshield. This allows our team to safely and easily remove the old windshield from your vehicle. We clean the surface – Next, it’s time to do some cleaning. Our technicians will thoroughly clean the pinchweld, which is the area where the windshield sits. If there’s any excess adhesive, we’ll remove it to make room for the new. Primer and adhesives are applied – Following the cleaning, it’s time to tape up the frame area and apply primer. We also apply a coat of primer to the outer edge of the new windshield. After the primer is applied, a new layer of adhesive will be spread. The suction cups come back out – We’ll grab the suction cups again to carry the new windshield to your vehicle. 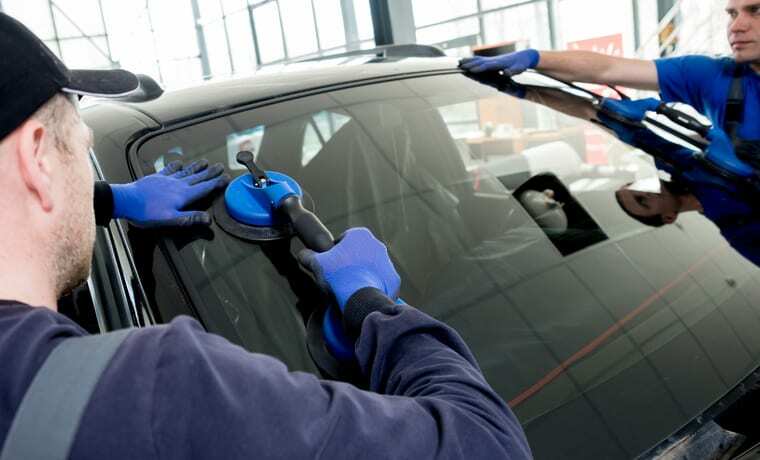 We give the adhesives time to cure – Finally, the adhesives on the windshield must set. This time required for this curing process time may vary, but it generally ranges from 30 minutes to 24 hours. Your technician will let you know when you can safely drive your car again. Do you need mobile windshield replacement services in the Claxton and Hazlehurst area? Or are you looking to learn more about auto glass services? Call A-1 Glass Masters today and discover how we can help you.